Made for the feet, designed for the body. Custom-made flexible orthotics are prescription shoe inserts. This means they are made just for your feet and will easily slide into your shoes and support the unique shape of your feet. In replacing the generic insoles it means balance will be brought to your feet, knees, hips, pelvis, low back, shoulders and neck. Just as everyone has a unique fingerprint, everyone has a unique body structure and foot shape. The benefit of using custom-made flexible orthotics is that they are made and fitted specifically to you. Custom-made flexible orthotics support and balance the body from the ground up. There are 26 bones, 33 joints and over 100 muscles, ligaments and tendons in each foot, which all need to move normally through their range of movement. Your feet are the foundation of your body, by balancing them means you are supporting your musculoskeletal system and overall health. Properly functioning feet also help protect your spine, joints, bones and soft tissue from stress as you move. Custom-made flexible orthotics go hand in hand with your chiropractic care, helping you hold your adjustments for longer, allowing you to experience a longer effect. What’s the difference between Flexible and Regular Orthotics? There are actually 3 arches in each foot. All 3 are interconnected forming a flexible and dynamic tripod like structure. This allows the foot to function as it was designed to, whilst providing balance to the entire body with each step you take over different types of terrain. It makes sense to wear orthotics that support all 3 arches and provides you complete support. Most orthotics only support 1 arch, commonly the medial arch. Custom-made flexible orthotics support all 3 arches in your foot: medial arch, lateral arch, anterior arch. By correcting the imbalances in your feet which have developed over time, custom-made flexible orthotics brings balance to your body’s foundation, in addition to your knees, hips, pelvis, low back, shoulders and neck. They offer more than just short-term symptom relief, but to help to restore the structure and function of your body from the ground up, and thus contributing to greater musculoskeletal biomechanics, health and quality of life. Supports the 3 arches in your feet to help balance your body. Made with flexible comfortable materials, allowing your foot to function normally. 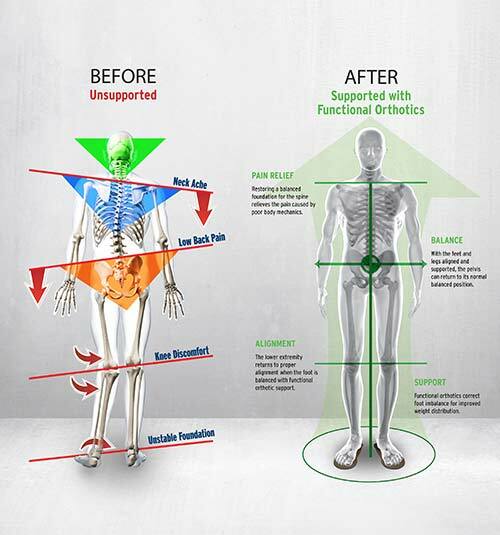 Promotes optimum posture and enhances chiropractic adjustments. 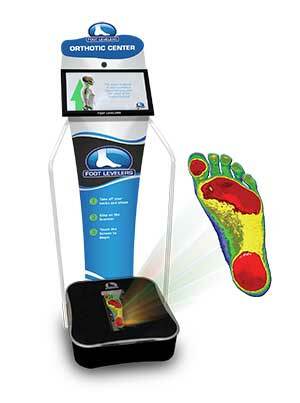 Based on the 3D laser scan images of your feet – made to fit your feet exactly. Only supports 1 arch, blocking normal foot motion, causing more harm. Does not provide custom support for your gait. Just adds cushioning to treat the symptom, rather than the underlying problem. Durability is questionable, so you may spend more money over time replacing them. Offers generic solutions for a number of foot conditions. Only supports 1 or 2 arches, often overcorrects and blocks normal foot motion. to stand or move on hard plastic. quicker due to abnormal loading.